mmCARD Recovery is an intelligent tool and easy-to-use interface. 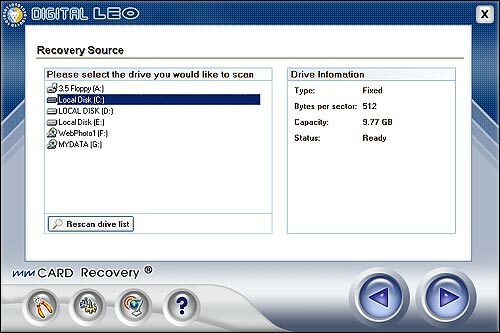 mmCARD Recovery is an intelligent tool and easy-to-use interface. 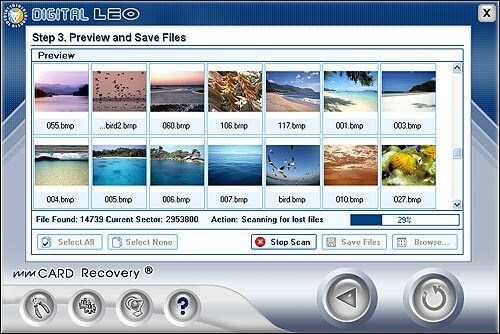 With many powerful features to help you recover digital images or and media files lost on corrupted, erased or damaged compact flash, smartmedia, memory sticks, mmd, XD, multimedia or secure digital memory cards when other solutions fail lost or erased images from many other types of digital media. 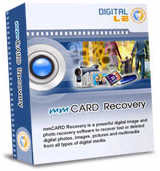 mmCARD Recovery is a powerful digital image and photo recovery software to recover lost or deleted digital photos, images, pictures and multimedia from all types of digital media including digital cameras, SmartMedia, CompactFlash, Sony Memory Sticks, IBM Micro Drives, Flash cards, harddisk, and others. Supports JPEG, TIFF, PNG, GIF, BMP, RAW Images, Canon CRW, Nikon NEF, Kodak DCR, Minolta MRW, Fuji RAF, AVI, MOV, MPG/MPEG, WAV, MIDI. The Single User License is designed to allow a single copy of software program to be installed on and used with only one computer.